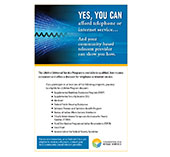 Printable PDF of poster supporting Lifeline and its services that are intended to provide discounts to eligible, low-income consumers to aid in the set-up and maintenance of their telephone or internet service. PDF includes English and Spanish version. For more information, contact Foundation for Rural Service.